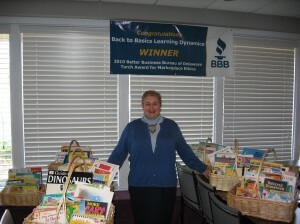 Back to Basics' "National I Love to Read Month" project will impact over 20,000 children in 2011 | Back to Basics Learning Dynamics, Inc.
Back to Basics Learning Dynamics' tutor Talley Brown shows just a few of the Children's Book Baskets that were delivered statewide throughout the month. It’s estimated that 93 million US adults have only basic or below basic literacy skills. Back to Basics Learning Dynamics, Inc. in a unique partnership with the literacy organization Success Won’t Wait, Inc., delivered close to 1,000 children’s books in Children’s Book Baskets throughout the State of Delaware during National I Love to Read Month. Each basket contained 40+ books including a wide variety of titles geared toward children of all ages and interests. Throughout February, National I Love to Read Month, Back to Basics tutors, office staff and students delivered the baskets to high traffic waiting rooms and lobbies in a variety of locations where children frequently wait. Some examples of locations that received book baskets include doctors’ and dentists’ offices, hair salons, dance and karate studios, and auto repair shops. Delaware high school juniors and seniors: Do you love libraries or writing? The 2011 Delaware Library Association scholarship competition is underway!